Learn to Dive. Get your PADI Open Water Diver here! Experience unparalleled adventure and see the world beneath the waves, with the PADI Open Water Diver course – the world’s most popular and widely recognized scuba diving certification course. Open Water Divers are certified to dive independently to a depth of 60ft/18m. One of our popular shipwrecks, The Forceful, located a short boat ride away from our dive center. PADI eLearning is now offered on a variety of devices from laptops, tablets or phone (both Android & Apple devices). PADI’s eLearning is a great option to work through the theory at your own pace through a friendly, interactive service and reduce time spent in a classroom while on vacation. You need to be fit for diving and have no pre-existing conditions on the PADI Medical Questionnaire. Any responses on the medical form with a ‘YES’ require a physicians approval to safely go diving. To avoid disappointment, please ensure all individuals wishing to participate have seen the PADI Medical Questionnaire and are cleared for diving. Directly from the shore next to our dive center, we have shallow clear water we can teach diving in. We ask our students to have their eLearning completed by the time they check in at the dive center. Generally we recommend three separate half days to complete the Open Water, but time requirements can change since it is a performance based course. Keep in mind that the course can be highly weather dependent as well. Contact us to discuss the specific timing based off your travel dates. How many other people will be in the course with me? 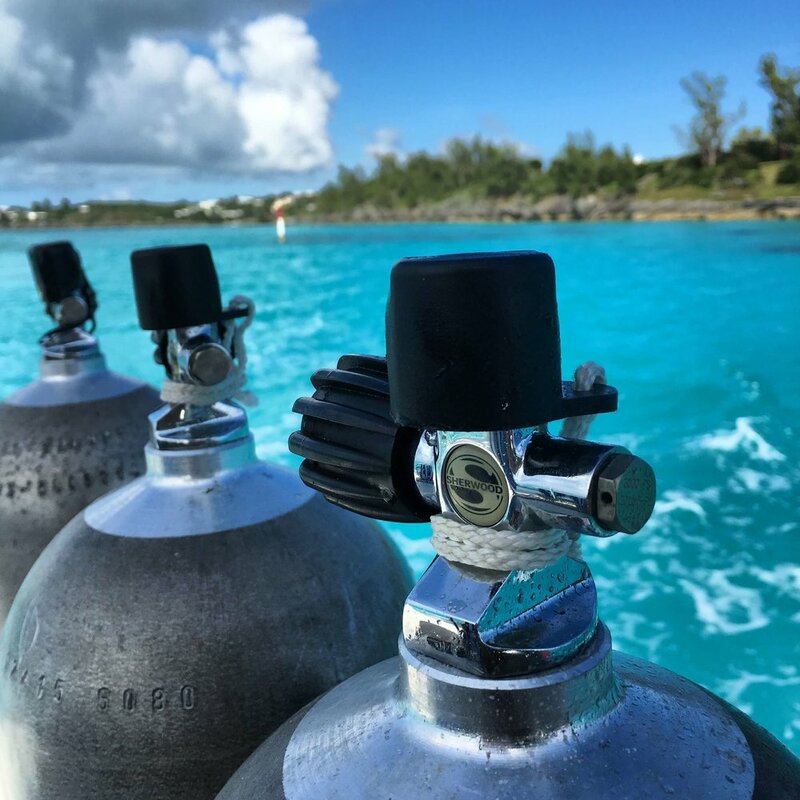 Here at Dive Bermuda we keep our courses small which offer our experienced PADI Instructors the opportunity to ensure you are getting the most from your course. If you prefer more individual attention, we can arrange a private course for an additional supplement. Contact us for any special requests. When are the Open Water Courses offered? We offer a range of PADI courses during our summer season which runs mid-May to end of September. These are the months in which water temperature and weather conditions allow for a comfortable and enjoyable introduction into scuba diving. There are NO courses offered October through early-May. Once you are medically fit for diving, you can enroll in PADI’s eLearning option- Open Water Diver Online. This digital course allows you to study at your own pace as you learn key concepts on how to dive safely and efficiently. When you arrive at the dive center you should have your completed eLearning form printed out and with you. You will be given a quick review by your PADI Instructor to review any final concepts that need to be addressed. Our reef here in the North Atlantic is some of the healthiest coral reef around thanks in part to the cooler water temperatures. Since our reef is quite durable the fish we see here are an array of parrotfish, damselfish, trumpetfish, wrasse, blue tangs and sergeant majors among others! The PADI Scuba Diver course is a subset of the PADI Open Water Diver course and opens the door to the underwater world. If you expect to go scuba diving primarily with a dive guide as offered at most resorts. This course is an intermediate step for earning an Open Water Diver certification if that’s your ultimate goal. It only covers 3 sections of the knowledge development, 3 sections of the confined skills and two open water training dives resulting in a limited certification. All the basics of scuba diving through knowledge development, a set of scuba skills in the pool/confined open water that you’ll use again during the open water dives and an appreciation for the underwater world that will keep you coming back for more bottom time every chance you get! Take a quick look of what you can expect when you learn to dive. To enroll in a PADI Scuba Diver course (or Junior Scuba Diver course), you must be 13 years old or older. You need adequate swimming skills and need to be in good physical health. No prior experience with scuba diving is required.